Welcome to the Parade Ground of the 93rd's Web Barracks. NOTE: If you are looking for Family/Genealogical Information -- THIS IS NOT THE PLACE! For a detailed look and some myth busting on the Battle of New Orleans, Click Here. A 501 (c) (3) Non-Profit Historical and Educational Organization dedicated to the authentic portrayal of one of the most famous Scottish Highland Regiments in the 19th Century British Army. If not for the Highland Regiments much of what we now call Scottish Traditions might have been lost forever. Living History recreates the way of life of our ancestors thus bringing history to life for spectator and participant alike. 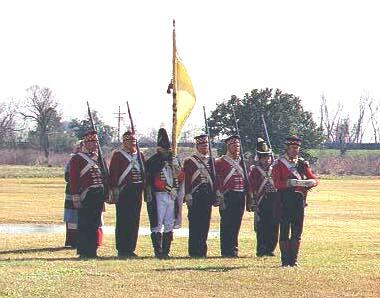 The uniforms and equipment of the 93rd SHROFLHU are exact reproductions of those used by the original Regiment in the 1800s. Many years of indepth research have been devoted to insure authenticity. 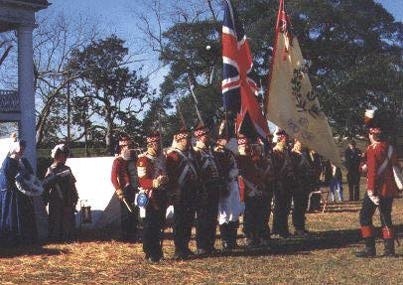 93rd Honour Guard at New Orleans, January 1995. Primary emphasis is on the 1812/Napoleonic era, extending into the Crimean War and Indian Mutiny of the 1850s. Participation at many events nationally includes the annual Battle of New Orleans at Chalmette National Historic Park, where a Wreath is laid and the names of the 93rd who fell at New Orleans are read aloud during a Memorial Ceremony begun by the 93rd SHROFLHU in 1989. The Roll Call of the 93rd fallen, January 1999. On 25 October 1854 during the Battle of Balaklava in the Crimea the 93rd earned immortal fame standing alone in line and repulsed a massive Russian cavalry charge, thus becoming the one and only "THIN RED LINE". For a more detailed history of the 93rd, Click Here. In 1881 the 93rd merged with the 91st Argyllshire Regiment and became the Argyll And Sutherland Highlanders which they remained as until the recent merger by the British government of all the Highland regiments. All RIghts Reserved. Apart from any fair dealing for the purpose of private study, research, criticism or review, as permitted under the Copyright Designs and Patents Act of 1988, no part of this website may be reproduced, stored in a retrieval system or transmitted in any form or by any means: electrical, chemical, mechanical, opitcal, photocopying, recording or otherwise witrhout the permission of the copyright owner.